For hundreds of years, Gitanos in Sevilla lived in a neighborhood called Triana alongside the Guadalquivir river. Some of the most beautiful and intense Flamenco was created here amongst the culturally rich Gitanos. The Spanish authorities and developers eyed their enviable location with dollar signs in their eyes and as with happens with gentrification around the world, the Gitano community was flung to the outskirts of the city to live in government created high-rise housing. In this foreboding place they attempted to carry-on the traditions they practiced for hundreds of years but unfortunately the geography of the area made this difficult. (There is a well-known story of the man who would take his donkey up and down the elevator.) 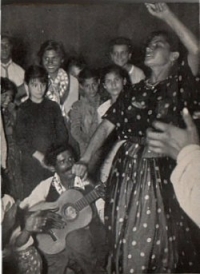 One tradition that did survive is Flamenco. The name of this place? Polígono Sur or Las Tres Mil Viviendas de Sevilla.